The Asian Human Rights Commission (AHRC) has received information that the Nepal police arrested 43 Madhesi activists on 21 May 2016 in Lumbini – Rupandehi and Sarlahi districts, when the country was celebrating the 2560th birth anniversary of Buddha. The Madhesi activists were not provided with any arrest warrants, and were kept in custody under 7-day remand. On May 27, the remand was extended for 10 more days. The activists are being kept in an overcrowded prison, and there is risk to their lives due to brutality by hill-origin inmates. Nepal Police arrested 31 Madhesi activists from Lumbini, the birth place of Gautama Buddha, who were chanting slogans including ‘Free Madhesh’, ‘Free Dr. CK Raut’, ‘End Nepali Colonization’, on Saturday, 21 May 2016. Nepal’s President, Prime Minister, Ministers, Parliamentarians, and guests from 28 countries attended the Buddha Jayanti ceremony at Lumbini to mark the 2560th birth anniversary celebration of Gautama Buddha. Among the 31 Madheshi activists arrested from Lumbini on 21 May, 11 were released on 22 May at 7 p.m., whereas the others were kept in police custody in Bhairahawa on a 7-day remand under public offence charge. On May 27, the police extended their remand for 10 more days. Similarly, 12 Madheshi activists arrested from Sarlahi district have also been placed on a 7-day remand under public offence. Twenty Madhesi activists are currently in police custody in Bhairahawa who were arrested from Lumbini – Bhagwan Das Baniya (22) Lumbini-2, Rupandehi, Prakash Paswan (35) Ramgram-4, Nawalparasi, Bijay Nath Yadav (52) Ramgram-4, Nawalparasi, Sudarshan B. K. (22) Lumbini-2, Rupandehi, Dharmendra Gupta (25) Lumbini-2, Rupandehi, Chandra Shekhar Sunar (31) Lumbini-1, Rupandehi, Ram Kesh Gupta (23) Lumbini-2, Rupandehi, Ajit Singh (24) Pathardeiya-2, Kapilvastu, Manoj Kumar Yadav (30) Pakadi-2, Kapilvastu, Jitendra Chaudhari (26) Bithuwa, Kapilvastu, Ram Bhavan Harija (30) Bijuwa-4, Kapilvastu, Yogendra Chaudhari (31) Maharajganj-3, Kapilvastu, Bijay Yadav (22) Patkhauli-2, Rupandehi, Dilip Yadav (32) Dayanagar-4, Rupandehi, Lila Prasad Pal (24) Manmateriya-6, Rupandehi, Bhopendra Yadav (26) Pokharbindi-4, Rupandehi, Abdul Khan (30) Mohammadpur, Bardiya, Irfan Sheikh (30) Mirminwa, Banke, Shiv Charan Kewat (26) Ramnagar-4, Rupandehi, and Ram Ashish Baniya (32) Lumbini-2, Rupandehi. Eleven Madhesi activists were released from custody after 32 hours of illegal detention and are on trial – Jagannath Yadav (18) Lumbini-3, Rupandehi, Shivshankar Lodh (18) Lumbini-2, Rupandehi, Shivchandra Pal (16) Lumbini-2, Rupandehi, Jugani Lodh (27) Lumbini-16, Rupandehi, Shiv Chandra Pasi (16) Lumbini-2, Rupandehi, Suresh Lodh (18) Lumbini-2, Rupandehi, Bijay Kumar Lodh (18) Lumbini-2, Rupandehi, Manoj Kumar Gupta (20) Lumbini-2, Rupandehi, Sundar Yadav (20) Suryapura-9, Rupandehi, Birendra Maurya (16) Asuraina-5, and Rupandehi, Jugani Lodh (27) Asuraina-8, Rupandehi. 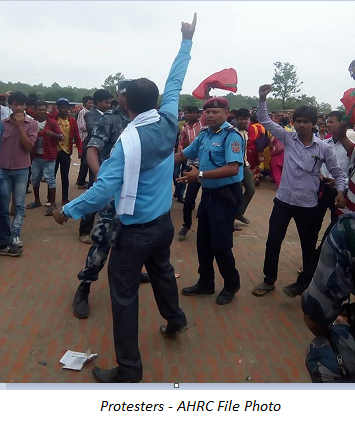 Nepal Police arrested 12 Madheshi activists from Sisauta of Sarlahi district on May 21, while they were holding a meeting in a local school to discuss a plan to clean their village. They are currently in Police custody in Malangwa, namely – Dharma Lal Ray (45) Haraiya, Sarlahi, Rabindra Mandal (29) Sisaitiya-7, Sarlahi, Rajendra Ray (33) Pidari, Sarlahi, Shambhu Kumar Yadav (27) Malangwa, Sarlahi, Suresh Ray (35) Malangwa-10, Sarlahi, Pawan Thakur (42) Tilathi, Saptari, Upendra Raut (55) Sundarpur Sukgachaina, Sarlahi, Hos Narayan Patel (27) Sisaitiya-7, Sarlahi, Dinesh Ray (30) Mohanpur, Sarlahi, Rangi Lal Thakur (35) Mohanpur, Sarlahi, Sunil Kumar Jha (28) Khairwa-2, Sarlahi, and Bijay Yadav (30) Madanpur, Sarlahi. Police officers allegedly beat one Krishna Mohan Yadav in police custody in Bhairahawa, and he was hospitalized. In Bhairahawa, Superintendent of Police (SP) Rameshwor Karki beat two of the activists so badly that they had to get hospitalized by the police. Similarly, three others were physically attacked and seriously injured by other fellow detainees of hill origin, in front of police officers. The injured ones include Sudarshan B.K., Bhagwan Das Baniya, and Chandra Shekhar Sundar. They are getting treatment in a local hospital, and the condition of one of them is said to be critical. A note from the detainees has emerged, with details on police torture, and they appeal for help from human rights organizations and journalists. The condition in the prison is pathetic; overcrowded and with no fan available. Due to excessive numbers of prisoners, around 127 as per the record, with only 4 rooms where maximum 10 inmates can be kept per room, the inmates have been taking turns to sleep. The Madheshi activists in police custody in Bhairahawa started a fast-unto-death on May 22. As a result, four of them lost consciousness and have been hospitalized. As no arrest warrants have been provided, all the activists have been kept under illegal detention. The AHRC demands the prompt release of the Madhesi activists, particularly with the threat to their lives from the hill origin inmates who are involved in beating and torturing the Madhesi activists. Furthermore, the activists who have sustained injuries must receive free medical treatment at the earliest. In recent months, the government has intensified its brutal suppression against madhesi supporters, led by Dr. C. K. Raut, through arbitrary arrests, torture and false charges. The Home Ministry has issued a circular “to do anything to curb the activities of Dr. C. K. Raut”, and has allegedly briefed district police to even kill a few activists in fake encounters. In the last five months alone, the government has filed 33 (48 including under-processing) sedition charges against the activists, demanding life-imprisonment for them. Dr. Raut himself is facing four sedition charges, despite both the Special Court and the Supreme Court giving him a clean chit on an earlier sedition charge filed against him on 8 October 2014. Despite getting a clean chit from the courts, his talks, video screenings, meetings and assemblies have been brutally suppressed by police, and essentially banned, with more than a thousand arrested, a hundred injured and more than a hundred fake cases filed against supporters over the span of a year. Dr. Raut himself has been arrested 11 times, and has spent several months in prison. Dr. Raut and other madhesi senior leaders are facing threats to life and physical injury from several quarters, including threats of encounter-killing from Nepal Army, Nepal Police and youth-wings of the ruling parties. Dr. Raut’s activities have been severely restricted by the state, even putting him under an undeclared house arrest in the past, preventing him from giving any interview or attending any public gatherings including religious ceremonies or funeral rituals. Recently, Press Council Nepal, the press regulatory body, took action against the ABC Television channel for interviewing and telecasting his interview, and has warned media outlets not to publish news and articles relating to Dr. Raut and his supporters. The Government of Nepal even had a row with the Nepal Human Rights Council (NHRC), apparently because its head granted a visit to Dr. Raut to receive a memorandum from him about the human rights violations in Terai/Madhesh. Please write letters to the following authorities calling on them to take necessary action against the police officers involved in this case. The AHRC is writing a separate letter to the UN Special Rapporteur on Torture and other Cruel, Inhuman or Degrading Treatment or Punishment, for its intervention into this matter. I am writing to voice my deep concern the Nepal police arrested 43 Madhesi activists on 21 May 2016 in Lumbini – Rupandehi and Sarlahi districts, when the country was celebrating the 2560th birth anniversary of Buddha. As no arrest warrants have been provided, all the activists have been kept under illegal detention. I demand prompt release of the Madhesi activists, particularly with the threat to their lives from the hill origin inmates who are involved in beating and torturing the Madhesi activists. Furthermore, the activists who have sustained injuries must receive free medical treatment at the earliest.